This terrific red quinoa salad is sure to please your family or dinner guests! It's a healthy blend of whole grain and tasty vegetables that makes for a hearty, delicious, low fat dish. Quinoa is often touted as one of the "Superfoods". It is very nutritious. Its protein content is very high and unlike wheat or rice (which are low in lysine), quinoa contains a balanced set of essential amino acids for humans, making it an unusually complete protein source. Quinoa is related to spinach although it is most always treated as a grain. It is really a seed and while it may not be as popular as some of the "grains" we typically associate with certain dishes, like oats or barley or even wheat, quinoa has numerous health benefits. 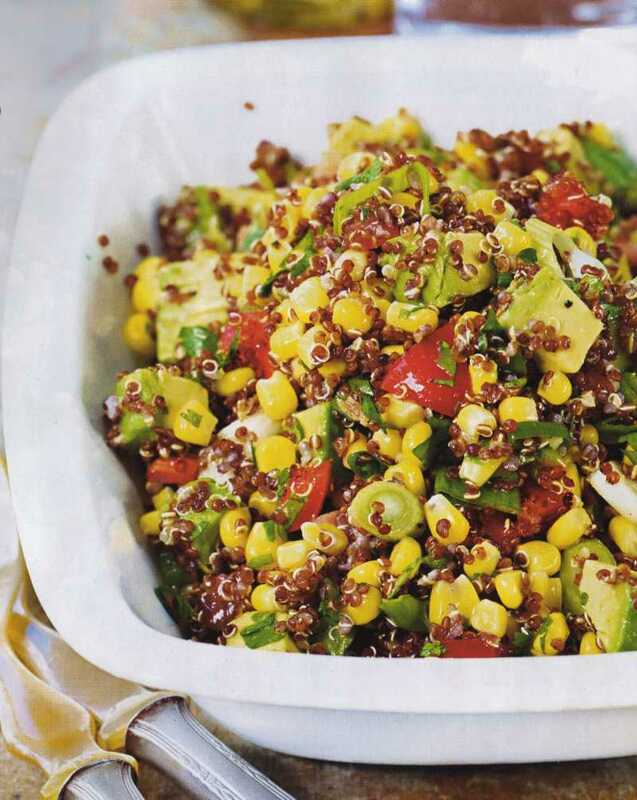 So this red quinoa salad is a great way to include healthy quinoa in your diet. It is a good source of dietary fiber and phosphorus and is high in magnesium and iron as well. Quinoa is also gluten-free and easy to digest. All we know is that we love quinoa and think you will too. So give this red quinoa salad a try - you'll be glad you did! and tomatoes to mixing bowl. Fold in the avocados and dressing; mix until well combined. saturated fat, 0mg cholesterol, 240mg sodium.